Clocking in at just under two and one half hours, The Hobbit: The Battle of the Five Armies, the last of Peter Jackson’s six films adapting J. R. R. Tolkien’s four Middle Earth novels, is the shortest. For those keeping track, more than 17 hours of screen time have been devoted to the three Lord of the Rings films and now three films based on Tolkien’s first novel in his saga, The Hobbit. This appears to be the end of a long road, with only ancillary Tolkien material still available for mining. And while it may be the shortest, it felt the longest to me. The Hobbit was initially announced as a two-part film to be directed by Guillermo del Toro, under Jackson’s supervision. Del Toro bailed after a protracted holdup over the film rights, and Jackson assumed the mantle of leadership, just like one of Tolkien’s characters. Magically, the two-part film became a three-parter. The trend of adapting novels to serve as multi-part movies, thus maximizing profits and marketing efforts, is a hot one in Hollywood; Harry Potter, the Twilight films, and The Hunger Games are all “tent pole franchises” with more movies than source novels, and Stephen King’s The Stand is slated to be adapted into four feature films. This is the age we live in. The irony is that The Hobbit probably would have made a fantastic three-hour film. When we last saw hobbit Bilbo Baggins (Martin Freeman), wizard Gandalf (Ian McKellen), and the company of dwarves hoping to reclaim their former mountain, mines, and gold from the dragon Smaug (voiced by Benedict Cumberbatch), Bilbo had just angered Smaug, and the dragon departed his lair to wreak havoc on nearby townspeople. Smaug is a truly impressive CG creation, and in hindsight, the previous Hobbit film, The Desolation of Smaug, was the most satisfying of the three. Five Armies opens with Smaug’s attack, and filmgoers unfamiliar with the novel will likely be surprised at how quickly the monster is dispatched, as if he is incidental to the story. Had the sequence been included at the end of part two, it would have served as an impressive finish to that film. As an introduction to the final installment, with no dramatic buildup, it feels anticlimactic and without weight; the only way for viewers to experience any dramatic tension is if they watch The Desolation of Smaug at home before rushing off to the multiplex. With Smaug out of the way, the remainder of the film becomes a sword and sorcery take on The Treasure of Sierra Madre, with dwarf leader Thorin Oakenshield (Richard Armitage) refusing to share the treasure with the now homeless townspeople, elves, and other residents of Middle Earth. His greed leads to the title battle, with orcs, trolls, and other monsters joining the fray, all part of Jackson’s plan to impart the same peril that the many battles in Lord of the Rings had. He only partly succeeds, because a war over riches doesn’t raise the same stakes as a war to save all things good from omnipotent evil. 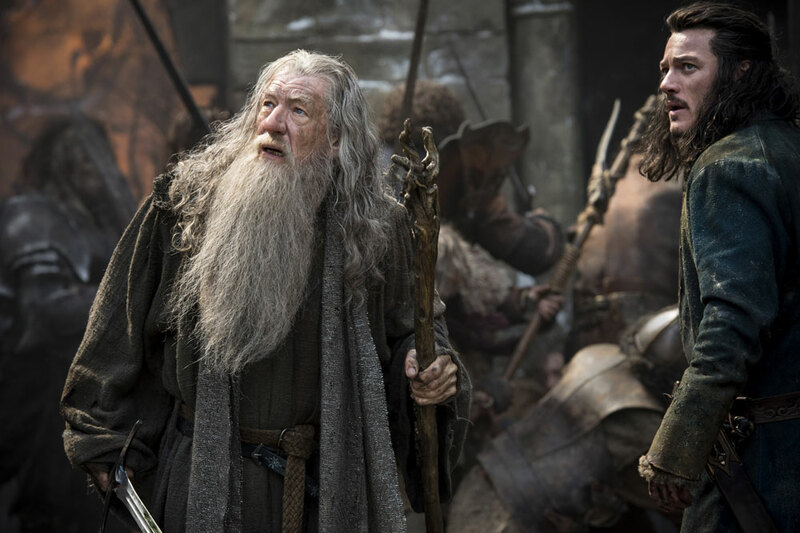 In Tolkien’s novel, Gandalf disappears from the action for long sections, and Jackson and his co-writers use this as an invitation to explore a subplot not found in the book, but referenced in others, which finds the White Council, consisting of Gandalf, elf king Elrond (Hugo Weaving), Lady Galadriel (Cate Blanchett), and fellow wizard Saruman (Christopher Lee), all returning from Lord of the Rings, on a parallel quest to solve the mystery of the Necromancer, setting up the reign of evil Sauron in Lord of the Rings. Doing so has enabled Jackson to pad out Tolkien’s relatively simple storyline with back-story which is the equivalent of George Lucas’s Star Wars prequels, though fans are less likely to mind its inclusion. Who can complain that legendary Christopher Lee (also featured in Lucas’s prequels) gets to appear in another fantasy blockbuster at the age of 92? Freeman, who has earned a fan following on such TV series as the original BBC version of The Office, BBC’s Sherlock Holmes, and Fargo, has real charm as Bilbo, but the expanded story and added characters reduce his title character to a supporting role; he’s almost lost in the mix. His scenes with McKellen are the best, but they’re few and far between. McKellen is the big carryover from the first trilogy, and his joy in playing Gandalf again is hard to miss. At the end of the day, Jackson and his army of collaborators have achieved something remarkable with this series, but I’m glad it’s over and Jackson can concentrate on other endeavors. This final entry feels like the last half hour of a traditional feature, stretched out to five times the length.